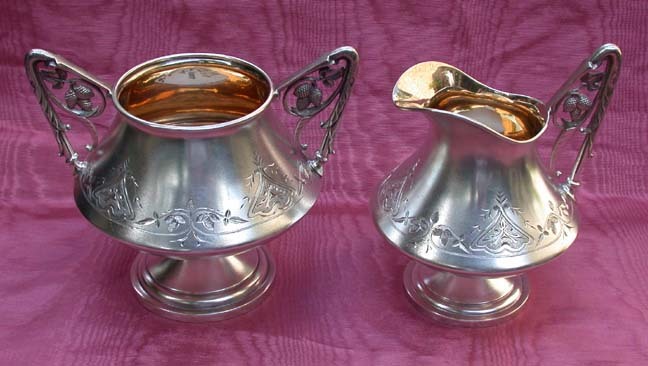 Phyllis Tucker Antiques | An American Sterling Sugar Bowl and Cream Pitcher Made by Tiffany & Co.
An American Sterling Sugar Bowl and Cream Pitcher Made by Tiffany & Co. The handles on this set are cast with berries and foliage. The decoration on the bodies are engraved and bright cut through a matt finish with gilded interiors. There is no monogram and no evidence of monogram removal. The sugar bowl measures 5 inches in height and 5 3/4 inches handle to handle. The cream pitcher measures 5 1/4 inches in height and 4 inches from handle to the widest point of the body.